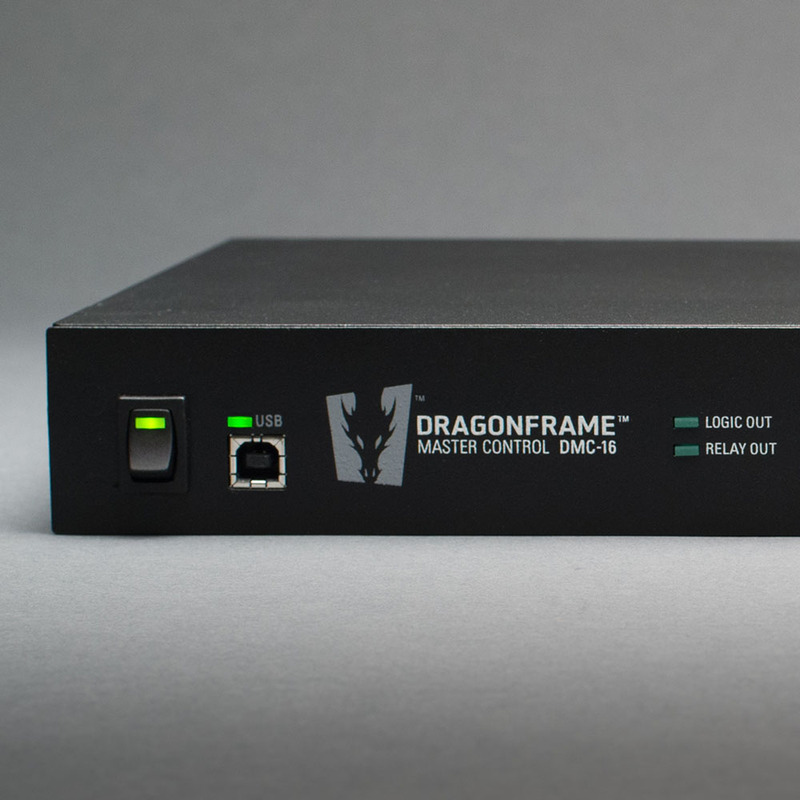 The DMC-16 (Dragonframe Master Controller) is a 16 axis motion control coordinator for use with Dragonframe software. 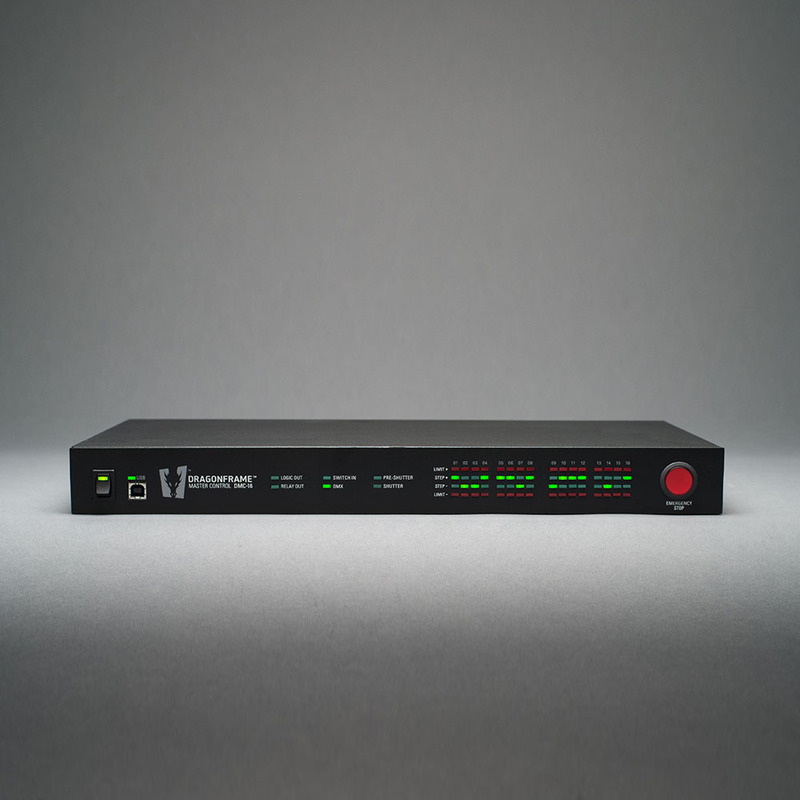 It provides sixteen channels of fully synchronized step and direction signals at speeds up to 200kHz, a camera trigger, DMX512 lighting control, limit switch inputs, and a set of triggers for interfacing with an external device. 16 channels of step/direction signals for use with stepper motor drivers. Maximum stepping pulse rate of 200,000 steps/second (200 kHz). 16 RJ45 jacks with differential and non-differential outputs for step and direction. One Kuper/Flair compatible DB37 step/direction output (non-differential). 16 limit switch inputs on DB25. (8 sets of low and high limits for motors 1-8). One camera trigger with separate metering and shutter outputs. One DMX512 output to control up to 512 lights. I/O Triggers for interfacing DMC-16/Dragonframe with another external device. Includes a relay, logic level out, a switch input, and an emergency stop input. Input Voltage: 115 VAC to 230 VAC. Power cord of your choice : US/UK/EU/None. Rack mount ears for mounting in a rack. Q: What’s the difference between the DMC-16 and using an Arduino for motion control? Why would I pay so much more for the DMC-16? A: The Arduino (with Dragonframe and our DFMoco sketch) is a great tool for motion control in stop motion and time-lapse, but it is very basic. It has a maximum motor speed of 20,000 steps/second, with fairly coarse acceleration/deceleration. The DMC-16 is ten times as fast, which smoother acceleration and deceleration. The Arduino provides basic shoot-move-shoot capabilities, whereas the DMC-16 can run moves at full speed. The DMC-16 also provides full DMX lighting capabilities and triggers. Q: Can I use the DMC-16 with Ditogear hardware? Do I need the Ditogear Dragonbridge? 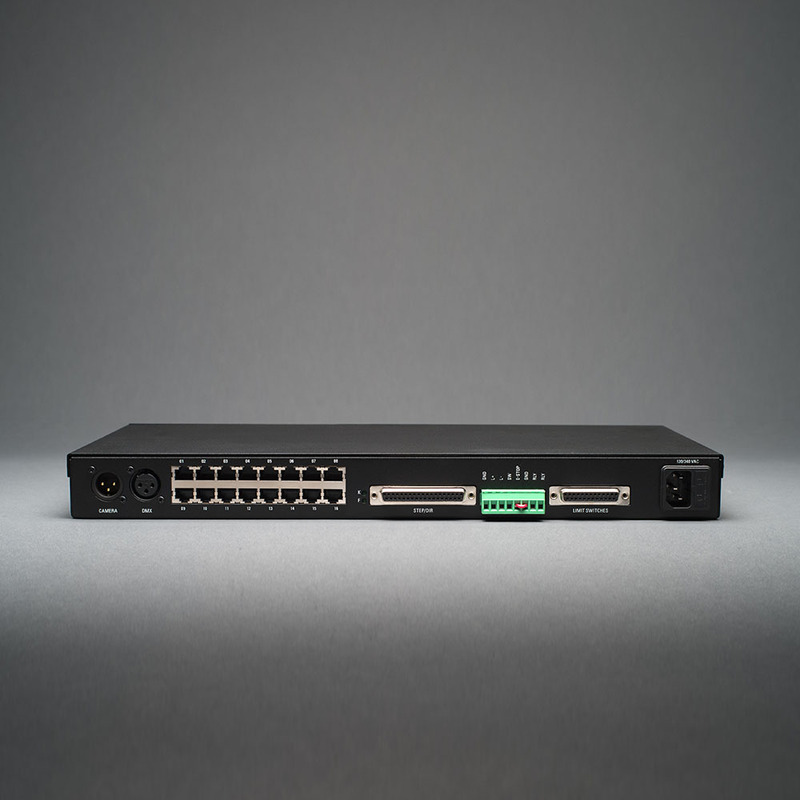 A: The DMC-16 provides real-time capabilities when using Ditogear hardware with Dragonframe. (Make sure to buy the DitoGear™ DMC-16 Adapter.) Alternatively, you can use the Ditogear Dragonbridge, which gives you shoot-move-shoot functionality similar to our Arduino DFMoco solution. You don’t need both. Q: Does the DMC-16 include powered stepper motor drivers? A: No. It provides step and direction signals. You need to use separate drivers, such as ones from Geckodrive. For a version with built-in drivers, see the DMC+. Q: Is the DMC-16 genlockable? Q: Is the the DMC-16 as amazingly awesome as it appears to be?